Fife Flyers' head coach Todd Dutiaume is pleased with the improvement of his team but wants to strengthen his roster. The Flyers are currently seventh in the standings following a win and a defeat against Manchester Storm and Dundee Stars, respectively. And Dutiaume revealed he is in the market to bring in some new blood to help the Flyers climb the Elite League table. "I think a couple of weeks ago in Belfast, we felt like we had started to turn a corner. I don't know if Saturday was our best performance as we were a little loose," said the Canadian. "Our offence has opened up a little bit, but at the back, we were a loose again and that possibly cost us against Dundee. "We've seen a bit improvement in the team, but we're struggling for consistency, which a few weeks ago was game to game, but it's more like period to period. "For us to contend on any given night, we're going to have to strengthen." The Flyers did enough to take the points from Manchester Storm in a 5-3 win on Saturday but at times didn't make it easy on themselves. TJ Caig's opener was cancelled out by Matthew Sisca but Flyers steamed into a 3-1 lead after two periods thanks to Shayne Stockton and Caig with his second. Paul Phillips reduced the deficit for Storm, with Justin Fox restoring the two-goal gap. Vinny Scarsella clawed another back for Manchester before Nicholas Rioux made sure of the points. The Flyers went to Dundee Stars on Sunday and a nine-goal thriller ended in favour of the Tayside men. Ex-Flyer Bobby Chaumont struck first for the Stars, before Stockton and Fox turned the game in Fife's favour before Ryan Dingle made it 3-1 for Dutiaume's side. Lou Dickenson and Curtis Leinweber levelled things for the Stars before Rioux and Brett Switzer traded goals for each team. Martins Porejs eventually struck the decisive goal. Dundee end the weekend in fourth place after picking up three points from four, with the third of those points coming in a penalty shots loss to Coventry Blaze on Saturday. Josh Godfrey opened the scoring for the Blaze, but was cancelled out by Switzer then Drew Fisher restored the lead for Coventry, but again they were pulled level through Dickenson. Justin Faryna and Cale Tanaka both scored for either team, where the game went to overtime then penalties where Blaze's Neil Trimm came up trumps with the winner. 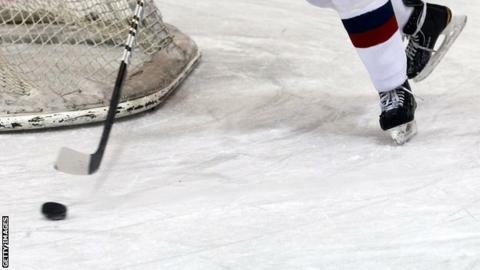 Edinburgh Capitals suffered two home defeats to Belfast Giants in a weekend to forget. On Saturday, Derrick Walser and Kris Beech had the Giants 2-1 up, despite a first period goal by Jacob Johnston before James Desmarais, Darryl Lloyd and Mike Radja added to the visitors' tally. David Rutherford clawed back another for the Caps, but Mike Forney and Beech with his second settled the game for the visitors as they romped to a 7-2 win. The Giants added a 3-1 triumph on Sunday, again coming from behind after Paul Zanette's opener. Braehead Clan go into Christmas with a winning feeling after taking both points from Cardiff Devils in a 3-1 win. However, Saturday's home visit by Sheffield Steelers didn't go so well as Clan were beaten 5-2 by the champions. Clan were three down without reply as Matthieu Roy, Jeff Legue and Fredrik Vestberg all found the net before Matt Haywood pulled one back. Luke Ferrara and Levi Nelson increased Sheffield's lead, with Matt Keith's driving effort pulling another back. On the road it was a brighter story as Ryan Finnerty's side took the points from the Devils despite Joey Martin opening the scoring for the home side. Scott Pitt levelled followed by Chris Bruton, who added a second to take the lead before Ben Davies, Clan's Welsh forward, clinched the points for the Glasgow men.